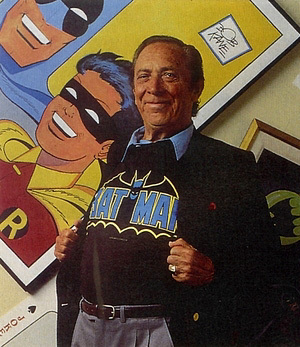 Bob Kane, the man who invented Batman and ruined Adam West’s career, died at the age of 83 after witnesses reported seeing a strange green and yellow gas rise from beneath his covers. When Kane first drew Batman in 1939, the crime-fighter lacked the inher-ent powers of Superman, and had to rely instead on his strength, agility, and legions of gay followers. Batman’s alter ego was Bruce Wayne, a rich man who vowed vengeance on criminals because, as a boy, he watched a robber gun down his parents while they were dressing up as bats. Even though he received stacks of fan mail every day, Kane still puzzled as to why so many of them asked about Colonel Klink. He is survived by his wife, one daughter, and millions of emotionally stunted baby-boomers who grew up thinking the Batman TV series was for real. This entry was posted in Uncategorized and tagged Bob Crane, comic books. Bookmark the permalink.